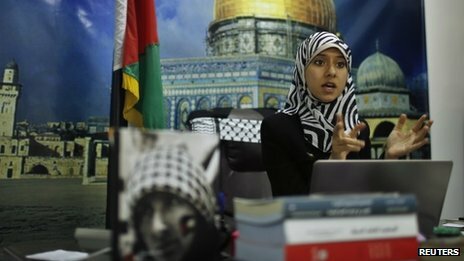 Hamas, the Islamist group that governs Gaza, is trying to present a new, friendly face to the world with the appointment of its first spokeswoman. Isra al-Modallal, 23, is a former Palestinian activist who retains a slight Yorkshire accent from three years living in the UK. She wears a traditional headscarf but light make-up, and unlike more conservative women she shakes hands with the male journalists when she visits our office. Ms Modallal used to work as a correspondent for the Iranian state-run English news channel, Press TV, and as a producer for a local Palestinian broadcaster. “It’s a very positive step forward for Palestinians in Gaza, especially for youth, but it’s also a big responsibility because I’m facing Western and Arab media too,” she says of her role. Ms Modallal stresses that while she will give the official views of the Hamas government on topics of importance, she is not a member of the group. Hamas, took control of the Gaza Strip by force in 2007 – a year after it won Palestinian legislative elections. It refuses to recognise Israel and is regarded as a terrorist organisation by the European Union and the United States. Israel and Egypt imposed severe border restrictions on Gaza after the Hamas takeover. Recently, the Sunni group has lost support from Shia Iran as it has backed Sunni rebels fighting the government in Syria, Tehran’s ally. Relations with Egypt have also been strained since its Islamist President, Mohammad Morsi, was ousted from power in July. Typically, tough-talking men with senior positions in Hamas have taken sole responsibility for dealing with Western media on its behalf. Ms al-Modallal is promising to bring a different, lighter touch. I ask whether she will break the usual rule of referring to Israel only as “the Zionist entity”. “If you’re a spokesperson in any government in this world you have to know what diplomatic speech is, and this is normal not just for the Hamas government,” she replies. She promises to refer to a range of sources when reporting on the situation in Gaza and says she reads Israeli newspapers as well as Western and Arab ones. However since starting her new post last week she has found that she is the main point of interest. 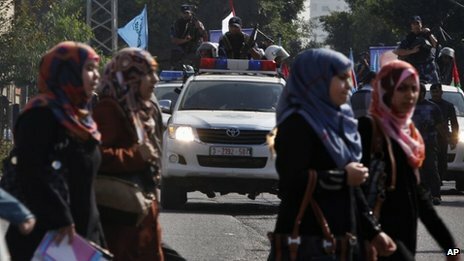 About a fifth of public servants working for the Hamas government are women. There is one female minister and several deputies. However, it has a patchy record on women’s rights. In the past it has issued specific orders for women to wear conservative dress, and banned them from smoking water pipes and riding on motorbikes, although these rules have not always been enforced. Women and girls were banned from joining a United Nations-sponsored marathon earlier this year, leading to the race being cancelled. Ms al-Modallal insists that she has other qualities that shape her world view. “I’m an activist, I’m divorced, I’m a mother, a Palestinian refugee,” she tells me. In the end, it could be her youth and inexperience that stand in the way of her progress as a spokesperson. She admits her knowledge of the arts is greater than that of politics and history. When asked about her future, she mentions the possibility of getting married again, which could curtail her freedom to work, or a return to studies. However, her recruitment does mark part of an attempt by Hamas to give its press operations a makeover, which has also led to the appointment of young members of staff to increase its social media output. Other spokespeople fluent in other European languages are being promised for the future.